HP unveiled the HP Z Workstation series –a reinvention of the product category from the core outward that offers customers unprecedented performance, value and serviceability in a sleek new design. The HP Z800, HP Z600 and HP Z400 Workstations are the culmination of more than 20 HP design innovations – including a self-checking power supply – and take advantage of the new Intel® Xeon® processor. HP’s engineering investment in the Z line already is paying off for customers such as Schlumberger, which reports it is realizing step-change performance improvements ranging from 300 to 500 percent on its flagship engineering applications. 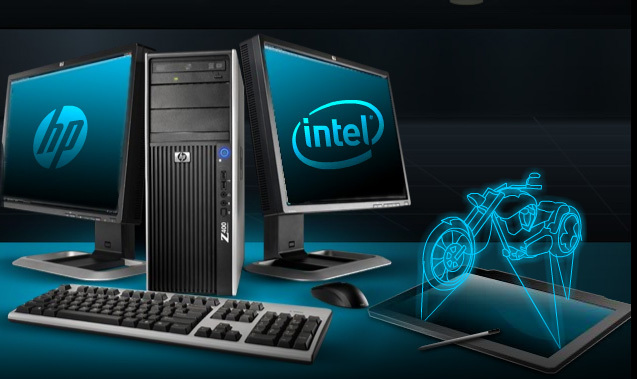 HP workstations are being used by the world’s most demanding power users in industries such as graphic arts, broadcast, computer-aided design (CAD), engineering, medical imaging, finance, and oil and gas exploration. Companies use HP workstations to design everything from running shoes to race cars, animated characters to deep-sea submersibles, and to manage everything from billions of dollars of tradable securities to mission-critical IT environments. The interior of the Z line offers a totally modular design, in which components slide neatly into place in a cable-less environment for optimal serviceability. On the outside, the Z line features a streamlined brushed-aluminum exterior inspired by automotive and industrial design leader BMW Group DesignworksUSA. “Opening the door of the new BMW Z4 and the side panel of the new HP Z Workstation reveals that both are as aesthetically powerful and innovative on the inside as they are on the outside,” said Verena Kloos, president, BMW Group DesignworksUSA. HP also debuted the HP SkyRoom technology, a professional-quality visual collaboration and conferencing solution that preserves the value of highly personal human interaction. HP SkyRoom is built on the company’s pioneering video and imaging engines. The resulting product is designed to deliver real-time visual communication responsiveness that is four times faster than a blink of an eye. (2) HP SkyRoom is currently in beta testing with customers around the world. The new HP Z Workstations offer next-generation Intel Xeon processor 5500 series with integrated memory controllers and Intel Turbo Boost Technology along with a new lineup of professional graphics solutions, built-in high-definition (HD) audio and an option for solid-state drives. The HP Z800 Workstation is HP’s most powerful and expandable workstation for users working with applications such as 3-D animation, broadcast video, oil and gas discovery, and medical imaging. 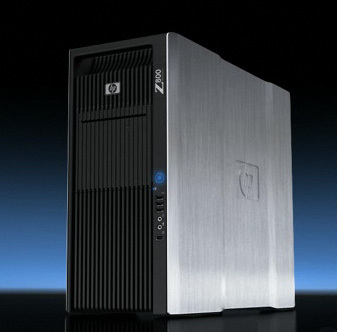 The HP Z800 has an all-new brushed aluminum industrial design with the modular internal design. The quad-core HP Z800 taps the new Intel QuickPath Technology to offer the most sophisticated input/output performance in any application scenario. It also comes with a liquid-cooling option. The HP Z600 Workstation is designed with the environment in mind, offering high performance in a compact size for professionals in industries such as video production, finance and midrange CAD. Featuring the same brushed aluminum exterior, internal modular design and serviceability as the HP Z800 Workstation, the HP Z600 Workstation can accommodate up to eight displays. The HP Z400 Workstation is a best-in-class entry-level workstation, offering top Intel processor performance at affordable prices for professionals working in video editing, photography, design and engineering. The HP Z400 is the first single-socket(3) workstation based on the Next-Generation Intel Microarchitecture (Nehalem) and can be built with the latest Intel Xeon processors. (4) The HP Z400 Workstation also comes with a liquid-cooling option. HP is a leader in reducing the environmental impact of its products, including workstations, often acting first to adopt new solutions designed with the environment in mind. For example, only the HP Z Workstation line includes a new HP-exclusive WattSaver(5) feature that manages power in the “off” state at less than one watt. In addition, the HP Z Workstations include 85 percent efficient power supplies – the HP Z800 Workstation has an option for an 89 percent efficient power supply – reducing both overall energy usage and the amount of waste heat released. The HP Z line already is ENERGY STAR® 5.0 qualified, ahead of the ENERGY STAR scheduled deadline of July. All HP workstations are more than 90 percent(6) recyclable by weight, and the HP Z line is registered as Electronics Products Environmental Assessment Tool (EPEAT™) Gold, the highest rating available. HP’s highly tuned workstations give customers an experience much like having an engineer in the box, with HP Performance Tuning Framework software that automatically tunes the workstation, finding and installing the proper drivers. This type of tuning can result in significantly improved performance and system and software stability. To further ensure stability for its customers, HP certifies drivers for commonly used workstation applications from vendors such as Adobe, Autodesk, CATIA, Dassault, Revit, Siemens and SolidWorks. Each HP workstation passes through HP’s legendary quality assurance and testing process, which goes beyond PC industry testing requirements. Due to superior acoustics engineering, many customers report they cannot tell by listening if the workstation is even running. HP offers more choices than any other vendor, with the broadest scope of options and the most specialized configurations, ranging from a choice of graphics cards and multiple display configurations to any operating system a customer selects.